An exciting and suprisingly easy way to enjoy sushi at home, this spicy tuna roll combines basic ingredients like canned tuna and mayonnaise into an exciting Asian-inspired dish. The simple flavors of tuna, crunchy cucumber and carrots, and zesty chili powder and wasabi make this delicious treat an easy to prepare delicacy. Chill until ready to serve, and dip in savory soy sauce and zesty wasabi before eating the whole roll! In small saucepan bring rice, water and vinegar to a boil. Reduce heat to medium-low, cover, and simmer until rice is tender and liquid has been absorbed, approximately 25 minutes. Let stand covered for 10 minutes. Set aside to cool. In small bowl combine tuna, mayonnaise, chili powder and wasabi paste. Break up tuna into small flakes and make sure all ingredients are combined. Cover a bamboo sushi mat with plastic wrap and lay a sheet of nori, rough side up, on wrap. Firmly pat a thick, even layer of rice over nori. Place 1 Tbsp of cucumber, carrot and avocado in a line along the bottom edge of the sheet, and spread a line of tuna mixture alongside the vegetables. Pick up edge of nori up , fold the bottom of the nori up , enclosing the filling and tightly roll the sushi into a thick cylinder. Once the sushi is rolled, wrap in the mat and gently squeeze to seal. Cut each roll into 6 pieces and refrigerate 2 hours or until ready to serve. Repeat until all ingredients are used. Back to the Sushi Recipes home page. I love this recipe. 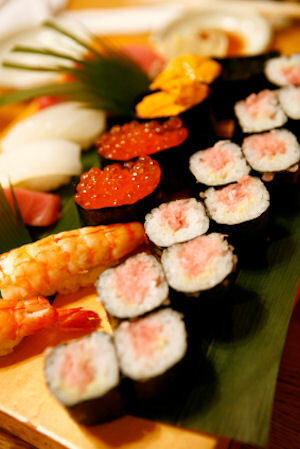 I love sushi, I thought i was eating at a real sushi place the first time i made. it. Can one use brown rice? Works with canned salmon instead of canned tuna too, and adding cheddar cheese makes it way better. I find rolling it in taco wraps makes it a lot easier. Way to go Taco Bell! Was awesome! I used fresh tuna though, made it a bit fishier but still yummy! Average rating of 4.20 stars based on 5 reviews. Summary: An exciting and suprisingly easy way to enjoy sushi at home, this spicy tuna roll combines basic ingredients like canned tuna and mayonnaise into an exciting Asian-inspired dish. The simple flavors of tuna, crunchy cucumber and carrots, and zesty chili powder and wasabi make this delicious treat an easy to prepare delicacy. Chill until ready to serve, and dip in savory soy sauce and zesty wasabi before eating the whole roll!